It's been a week of KidPages! If you've missed any of the previous posts, you can find them here: Bradley, Maxwell, Aaron, Amy. For this final day, I'm sharing three of Mike's favorite recent reads. I'm sorry to any of you who thought Mike would be writing today's post. These are his recent favorite books, but if you think he'd be caught here writing a guest post, um, no, not in your wildest dreams. The following reviews will be in my own words, same as for everyone else in this family. C'mon, you thought when I said he got to have "a say over here" that I actually meant a say? When it comes to reading to our kids, Mike and I share the pleasure of it pretty equally. Of course I do the majority of the reading during the day, but Mike often reads to them in the early morning while I'm out running, and we usually both take a turn reading to them at night (or we split them up, and he reads to Bradley while I read to Aaron and Max). I think reading has become a bigger part of his parenting than he ever imagined, but he likes it that way. Just last night, he realized that Bradley had been shortchanged because he hadn't yet heard Hooray For Fish by Lucy Cousins. That was a favorite book for both Aaron and Max when they were younger, and Mike and I were both aghast that we almost missed it with Bradley. Don't worry, Mike read it four times last night to make up for our negligence. never mentioned it to me, but as soon as he saw it in the library stack, he said, "Oh I remember that book! It is such a cool one." And later that night, after the boys were in bed, he made me look at it just so I could see for myself how cool it was. 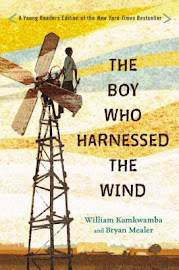 It is not a story so much as a journey; a journey across black-and-white countrysides and through silhouetted cities. The illustrations are simple and stark and definitely captivating, but it's not until the last page where it says, "We watched as the sun set. Time to turn around." that you realize just how cool of a book it really is. At that point, you flip the book upside down and suddenly what you thought was one thing has now turned into something entirely different. "Then we went to a movie..."
"Then we had dinner in a restaurant..."
Go ahead, you can say it's pretty cool, too. The first time you read this book, the pictures are all one big wondrous surprise; you can't believe that the movie theater magically turns into a restaurant. The next time you read it, the original magic fades a little, but now that you know what the two views of the picture look like, you notice things you didn't see the first time, so it's magical in a different way. This would be a great tool for discussing silhouettes, perspectives, shapes, and contrast, and it would be the perfect lead-in to creating some reflective art of your own. 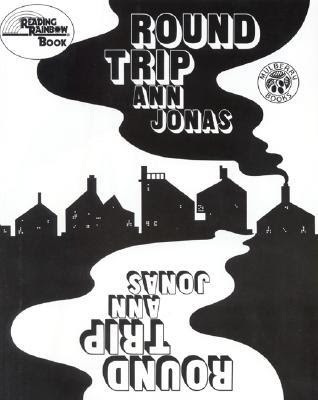 As a funny side note, I was going to say that Ann Jonas' artwork reminded me of Donald Crews', and then I found out that she's actually married to the guy! Remember The Beetle Alphabet Book, which I featured in the bugs books post? 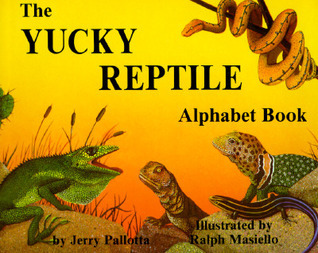 This one is written by the same author (different illustrator though), and it is every bit as fascinating to learn about reptiles as it was to learn about beetles (much to my surprise). Each letter of the alphabet showcases a different reptile, and alongside the letter and picture is a super interesting fact about that animal. For example, did you know that the chameleon's tongue can be almost twice as long as its body? Or that the Knob-tailed Gecko licks its eyes to keep them clean? Or that the Tuatara was alive when dinosaurs were on the earth? My boys are at the perfect age to enjoy this book because the illustrations are life-like, the information on each reptile is short but so fascinating and memorable (I can't count the number of times they've reminded me that the Komodo Dragon is the biggest lizard in the whole world), a variety of reptiles are shown, and a little alphabet review gets smuggled in at the same time. Mike likes it when the boys ask questions and remember little details, and this book provides the perfect backdrop for both. Iggy is a young boy with a passion for designing and building things. When he was two, he built a tower out of (dirty) diapers, and he hasn't stopped since. But things change in second grade. His teacher had a horrible experience when she was a young girl in a very tall building, and ever since then she has been anti-architecture and forbids Iggy from building anything in her classroom. 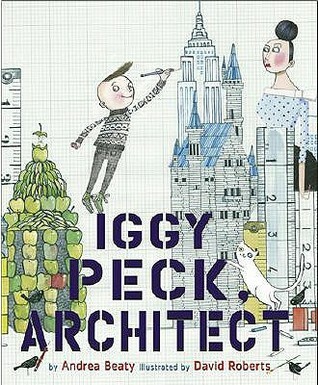 Luckily, she has a change of heart during a class outing when they become stranded, and Iggy uses his inventiveness, creativity, and love of building things to design (and then build) something that will help save them all. It is a pleasure to read this book because it meets all Mike's rhyming requirements, as stated above. Here's an example: When Iggy was three, his parents could see / His unusual passion would stay. / He built churches and chapels from peaches and apples / And temples from modeling clay. The illustrations are full of fine lines, rulers, graph paper, and pencils--all things that, while probably not very accurate anymore, are what we'd expect from an architect. There are lots of picture books about fire fighters and teachers and doctors but not really a lot about architects, so this book stands out not only as one that encourages kids to pursue their dreams, but also one that spotlights a different kind of career. And that wraps up this week of KidPages! 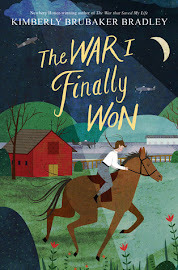 It's been fun writing about all of these books that we love so much, and I hope you've enjoyed it, too. If you check out any of these books (or have read them previously), I would love it if you'd share your thoughts on them. 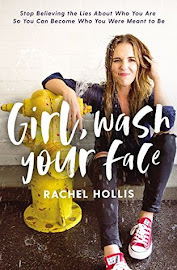 Amy I have become a regular reader of your blog! Love your passion for books of all kinds and I use your blog as a resource before I hit up the library now. Thanks! I LOVE the look of Round Trip! It seems I read a book like this when I was younger but heck if I can remember. On the wishlist it goes.